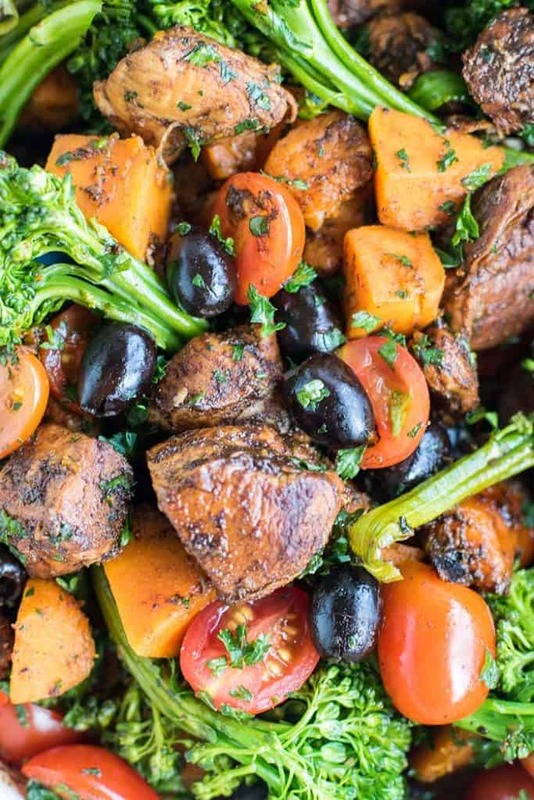 This One Pot Balsamic Butternut and Chicken is a quick, healthy, and super flavorful meal! It’s Whole30 approved – but delicious enough for a family meal any night! I love the leftovers of this dish over a bed of lettuce or spinach the next day for lunch. This post has not been sponsored by Capizzano Olive Oils and Vinegars, however I did receive free product. I am sharing it with you today because I genuinely love it and recommend it! I am planning on purchasing some gift sets for the holidays because I love it so much. I have been making more of an effort lately to create meals that only require 1 pot or pan. It’s so easy to start making dinner, throw something in the oven, put something in a sauce pan to cook, and then grab a frying pan for some saute action. Before you know it, the kitchen is a mess. This dish isn’t super quick to make, because I allow the butternut squash to cook slowly, and then take it out to cook the chicken. However, because you’re cooking in steps like this, you can prepare your squash, cook it, and prepare the rest of the ingredients during the time it takes the squash to brown and soften. You’ll probably have time to sweep up the floor and wipe down your counter while this is cooking, too. Having a clean kitchen by the time you’re meal has finished cooking is always a plus in my book. Who else hates cleaning the kitchen after eating? So much better if all you have to do is wipe down a few plates! I used my Capizzano Private Reserve Aged Balsamic Vinegar. I love balsamic vinegar- I use it almost daily. I have never had such a naturally sweet and smooth vinegar before trying this one. Honestly, it’s almost too good to do anything with other than drizzle on everything. But — it creates magic in this dish! You can use any balsamic in this recipe — a typical vinegar will sweeten up as the sauce gets really thick. The Capizzano doesn’t need to cook nearly as long to be a perfectly sticky and sweet sauce. It’s already extra thick and sweet, so you don’t have to cook it down as long. If you’ve never tried chicken cooked in balsamic before, now’s the perfect time! It seriously is the best — the chicken stays so moist, and the sticky sauce on the chicken is incredible. Make it Whole30: Be sure to use balsamic vinegar and not a glaze that likely has extra sugar added. 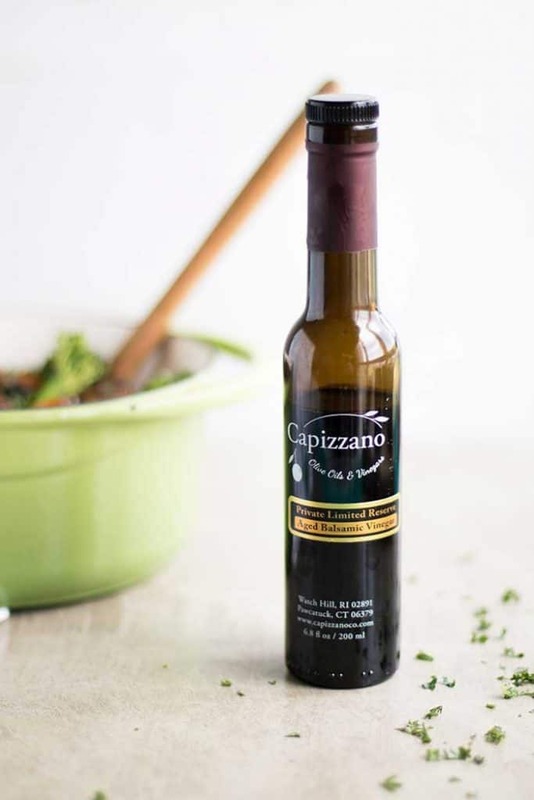 Capizzano’s Aged Balsamic Vinegars are so sweet and perfect for the Whole30. For the Family: My son loves this dish – I chop up the veggies and chicken, and often mix his with rice or quinoa since kids tend to be little carb monsters (and need more carbs than adults). This delicious one pot meal combines sweet roasted butternut squash, and sticky balsamic glazed chicken. Throwing in some tomatoes, olives, and herbs makes a flavorful and very healthy meal. 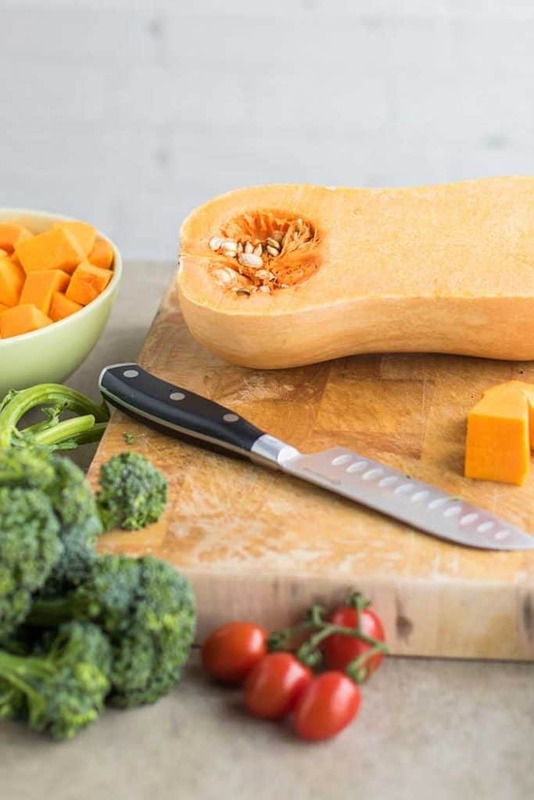 Peel the butternut squash, remove the seeds, and chop into large chunks. In a large pot or dutch oven, add olive oil, and butternut squash chunks. Saute over medium heat, and season with sea salt and black pepper. Cover with a lid, and allow to continue to cook for 10-15 minutes, until squash has softened and has browned. Remove the squash from the pot, add more olive oil, and the chicken chunks. Season with salt and pepper and lightly brown, then add the balsamic vinegar. Cook chicken in the vinegar over medium heat until the chicken is completely cooked through, and the vinegar has formed a thick and sweet sauce. Keep cooking until there is no vinegary-tang left in the vinegar. I've been told it always tastes like teriyaki (but better in my opinion!) when it's cooked into a glaze like this. Add back in the squash pieces, and stir to coat. Then add the broccolini, and cover for 2-3 minutes to allow to soften. Add the tomatoes, olives, and parsley, and cook for another 2-3 minutes until warmed through. Serve similarly to a stew (there won't be a lot of sauce, but there should be some sticky balsamic glaze to spoon over the top of each dish). It's great as is, but you could also serve this on rice, quinoa, or cauliflower rice. Hey Michelle. Yeah, balsamic vinegar is really good in preparing a meal. 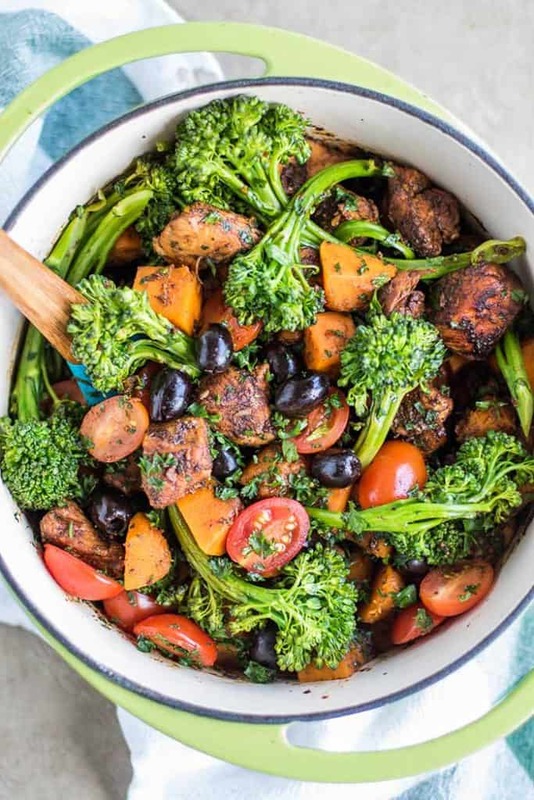 This one-pot meal looks absolutely mouthwatering and seems healthy. Really glad to discover this recipe. Thanks, and by the way your son looks adorable <3. Oh, thanks! My son is adorable, and such a sweet and energetic little guy. 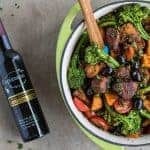 I love balsamic vinegar, and use it often with chicken, veggies and salads. So much flavor! I am glad you like this dish-- we have made it every week for the past month. So easy, so healthy, so yummy! Thanks Andy! It is a great dish. We have been making it often. Her balsamic is so sweet and thick it doesn't even need to be cooked down in this dish-- but it's pretty magical when you do cook it down! This sounds delicious! And I love that it's Whole 30 compliant :) Thanks for sharing - I want to try it now! It's my favorite dinner lately -- all my favorite veggies, and the chicken stays so moist when cooked in the vinegar! Hope you enjoy! Sounds perfect for a quick, healthy, weeknight meal. The olives really make it Natasha! Chock full of veggies.... just how I like it! Yum! I'm so all over everything Whole30 right now and this is just perfect. Such a great combination of healthy ingredients and flavor. Love it!